An escrow is a ﬁnancial arrangement where a third party holds and regulates payment of the funds required for two parties involved in a given transaction. It helps make transactions more secure by keeping the payment in a secure escrow account which is only released when all of the terms of an agreement are met as overseen by the escrow company. Escrows are very useful in the case of a transaction where a large amount money is involved and a certain number of obligations need to be fulﬁlled before a payment is released like in the case of a digital currency being bought where the buyer might want conﬁrmation of the delivery into wallet before making a full payment, and the seller doesn’t want to transfer the currency without any assurance that he or she will receive payment. While traditional escrow service is quite difﬁcult and must be obtained through banks and lawyers, Gems Mobile Money Escrow provides online escrow services at affordable rates. While the payment is 'In GMM Escrow' the transaction can be safely carried out without risk of losing money or merchandise due to fraud. This eliminates all legal jargon and allows for secure transactions and conﬁdent buyers and sellers. Ready to Buy? INITIATE AN ESCROW Now! Visit the Digital Currency Market to view and choose currency and preferred seller. Having chosen preferred seller, do take your time to read the Buyer's tips. Having read the Buyer's tips, you may go ahead to strike a deal with your preferred seller (If you're not using an Escrow service please play along with smartness) but if you'll love to have a safer transaction with our ESCROW service do read about HOW IT WORKS. But if you were unable to see your preferred listing, you may post a buying request for FREE on My Currency Store. Visit the Digital Currency Market to view and choose currency and preferred buyer. Having chosen preferred buyer, do take your time to read the Seller's tips. Having read the Seller's tips, you may go ahead to strike a deal with your preferred buyer (If you're not using an Escrow service please play along with smartness) but if you'll love to have a safer transaction with our ESCROW service do read about HOW IT WORKS. Ready to Sell? INITIATE AN ESCROW Now! As most corporate E-Currency exchangers/sellers in Nigeria offers the currencies at prices which in some cases seem too high for individual traders to afford, hence the introduction of Gems Mobile Money Digital Currency Market to create an open floor for everyone to buy and sell at flexible prices without barriers. Having introduced the Digital Currency Market, we understand the threat of transaction insecurity that might be posed by an uncontrolled market, this is why we deemed it necessary to include and introduce a less costly and easy-to-use ESCROW service to the market in order to protect various unsuspecting buyers and sellers from any form of scams and/or fraudulent dealings which may ensue from various transactions. Therefore, GMM ESCROW reduces the risk of fraud by acting as a trusted third-party that collects, holds and only disburses funds when both Buyers and Sellers are satisﬁed. 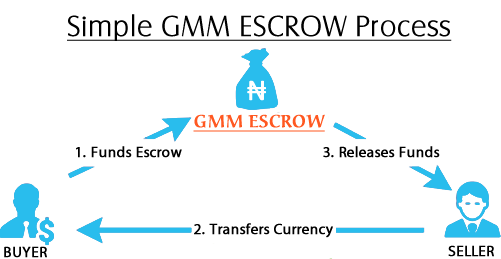 How Does GMM Escrow Work? Make more earnings reselling our goods and services!